The 7,000 nutmeg farmers on Grenada bring their crop to one of the 16 receiving stations on the island. The farmer receives EC$2 per pound for his nutmegs. At the receiving station, they are examined and any defective ones are discarded. The nutmegs are then transported to one of the three processing stations at Gouyave, Victoria or Grenville. For a small fee, you can visit a processing station and take a tour with one of their knowledgeable guides. It is a labor-intensive industry and, having seen it, you’ll wonder how we can afford to buy this precious spice so cheaply. It’s amazing how many hands each nutmeg goes through. Nutmegs are left to dry for six to eight weeks, and the mace is aged from four to six months. Mace is graded into three categories. Prime quality mace is used for culinary seasoning and brings the farmer EC$4 per pound. The second and third grades bring EC$3 per pound and are used in food preservatives and cosmetics respectively. In Gouyave, the station has been open since 1938 and little has changed on the production line. After drying, the nutmegs are put through the de-shelling machine. This merely cracks the nut, which is then removed by hand. A team of ladies completes this process and sifts out damaged and infected kernels or any that are not yet open. The defective nutmegs are bagged and sent to the oil distillery in Sauteurs. The good nutmegs are given the water test. Placed in water, nutmegs with a desirable high-oil content will sink. Floaters contain less oil and will be sold to the cosmetic and pharmaceutical industries. The wet nutmegs are left to dry for another 24 hours. The next step for the top-grade nutmegs is sorting by size; 110 small nutmegs will equal one pound in weight, the same as 80 large nutmegs. Each sack for export contains a total of 140 pounds of nutmegs. The gunny sacks are sewn on the premises close to where the tour ends. Here is the small print shop where the destinations are stenciled onto the sacks by hand. 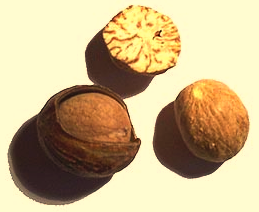 In the course of one year, Grenada processes between three and four million pounds of nutmegs – roughly one quarter of the world’s supply. Admission fee is EC$2.70 (US$1) per person. Open 8 am-4:30 pm, Monday to Friday. Please remember to tip your guide. If you’d like to photograph, please ask the guide at every stage. The guide will in turn ask the workers if they mind. Don’t be offended by a refusal. They are being photographed daily, often without permission or even a simple thank you.